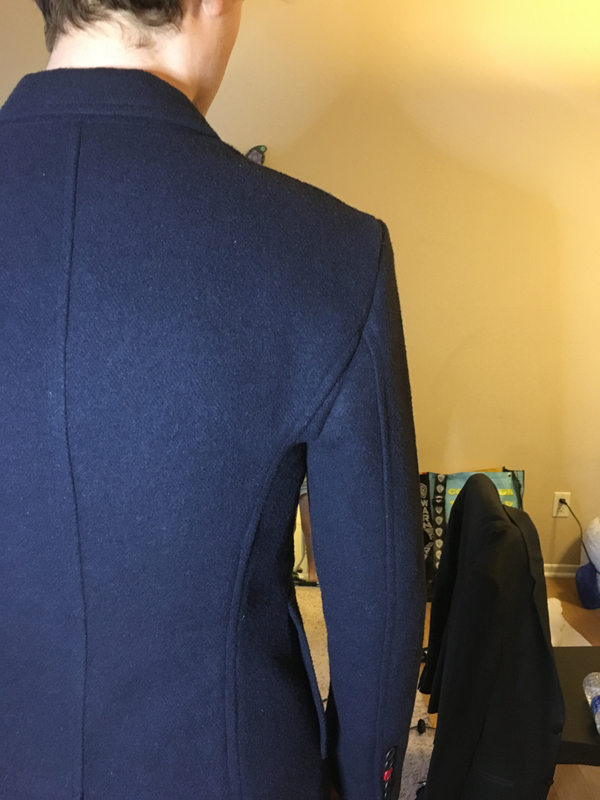 If you remember from the last post, I had altered the body of my coat to a satisfactory size – which included taking over 5″ from the waist and 3″ off the sleeve length. The next task was going to be the real nerve-wracking task: The lining. 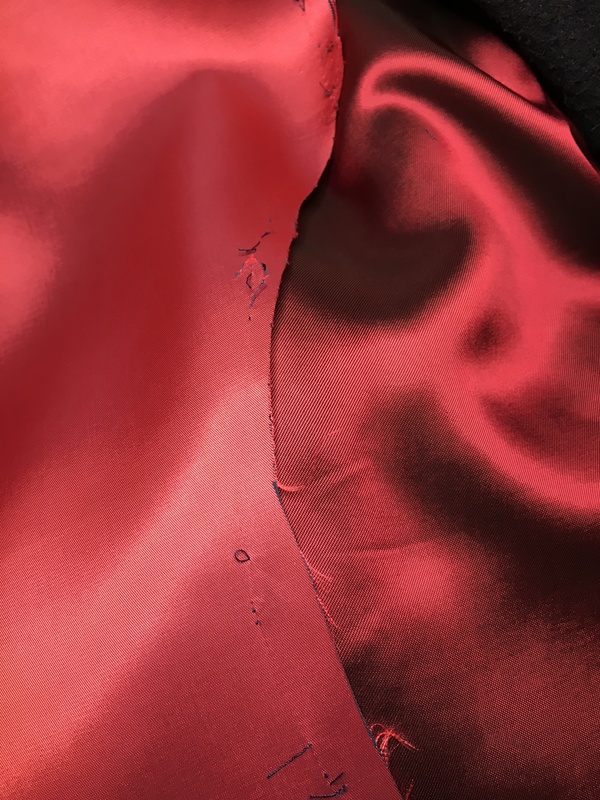 I owned 2.5 meters of the real, screen accurate lining from S9, a beautiful silk of red shot with black. I couldn’t afford to replace it, so I was extremely tentative to do anything at all with it, lest I inevitably screw it up. So I set the lining aside. The first task at hand was to alter the lining to match the coat modifications. This required me, first, to disassemble the lining pieces. I patterned all the pieces as carefully as I could. I then measured the size of the new panels on the coat body and drew the new shapes onto the paper. This was a bit trickier than anticipated, but not too difficult once I got the hang of it. I also pinned the old lining together at the seams with the new lines to gently check and make sure I didn’t cut it too tight. Once I was satisfied, I cut out my new pattern pieces. But I suddenly had a dilemma. In the Abbyshot coat, the front lining has a pleat in the chest. I don’t know why this pleat is there. It doesn’t exist on the original coat. I realized, while researching it, that this was indicative of a non-screen accurate detail on Abbyshot’s coat: The real front lining comes all the way up to the roll line. The pleat couldn’t exist on the real coat, because it would then show when the coat was open, which it usually was. 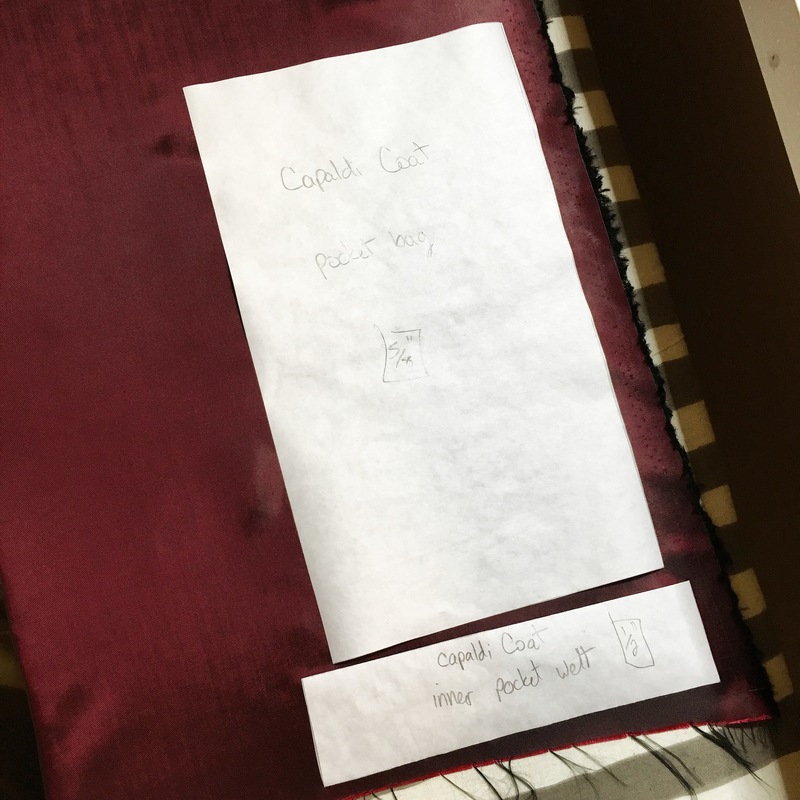 EDIT: Now, several years after altering this coat and writing this blog post, it has since come to my attention that this pleat does actually exist on the original coats. That kind of pleat is fairly standard and helps to absorb the stress put on that part of the lining from the inner pockets. 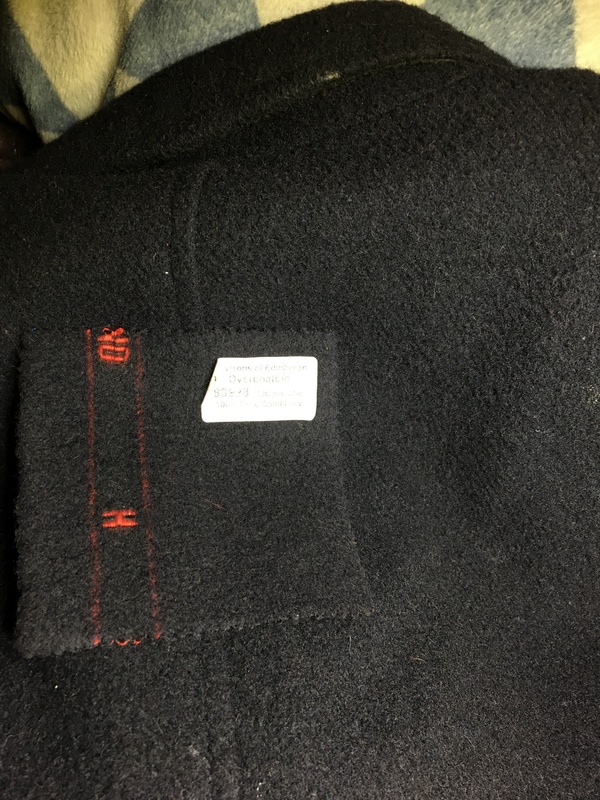 Having been able to examine a real Chris Kerr-made coat in person, Abbyshot got this detail totally right and I went out of my way to screw it up. Whoops! 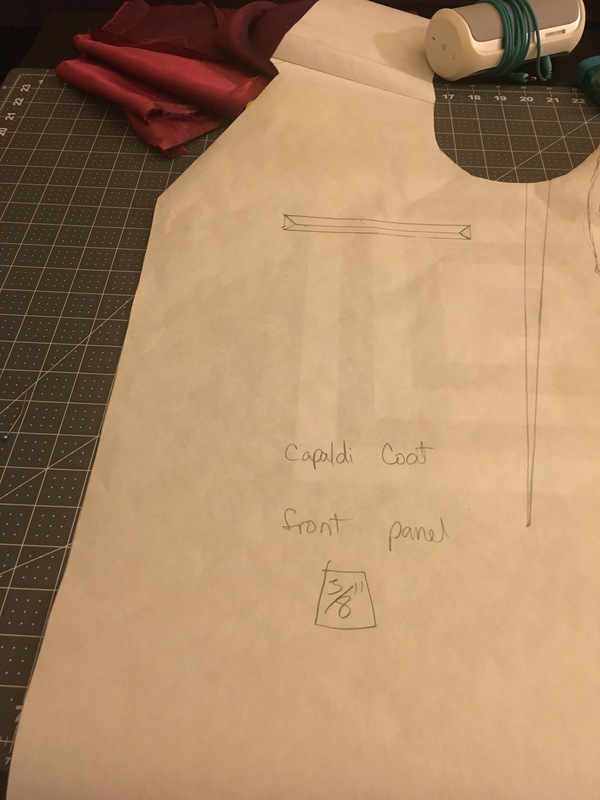 Very nervously, I had to repattern the front panels to remove the pleat and redraw the place it connects to the facing. This required some measurements off my coat. Eventually, I had something I was pleased with. It was time to start cutting my lining. I was still terrified. 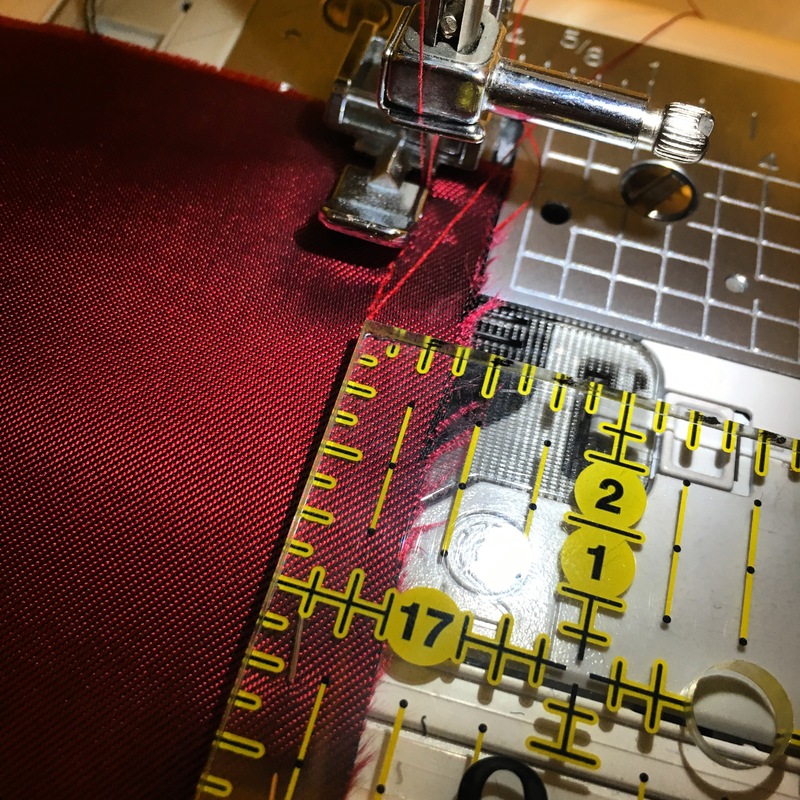 The first thing I did was press the fabric – which turned out to be extremely difficult and frustrating. I couldn’t press the creases out without it being wet, and spraying it with water – or spraying my press cloth with water – resulted in some very ugly water marks. I hadn’t even cut it yet and I was ruining my nice fabric! I spent probably two days researching how to press the cloth properly – to pretty much no avail. I compiled a few different ideas and talked to a few of my friends and made an educated guess. I cut some swatches and tested on them. Thankfully, it worked. So I moved forward. Even after all this, I was scared to really start in on the lining. So the first thing I did was cut the pocket bags and welt. That was very quickly accomplished, however. My plan for pressing the silk was to cut the piece, soak the entire thing, and then press with a cool iron and a press cloth. I tried the full size test on these simple, square pieces, to make sure the shapes didn’t warp and alter size significantly. It worked beautifully. I moved on to the sleeves, the next simplest thing. 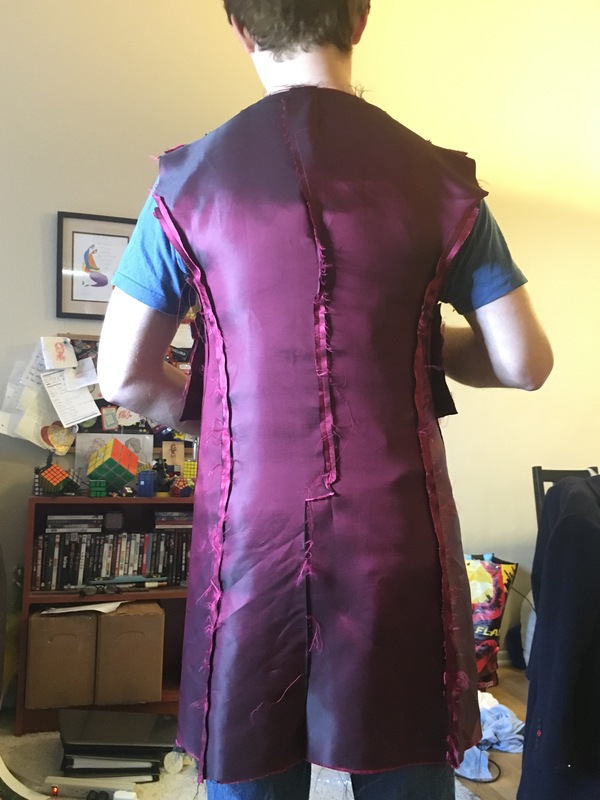 I cut my two pieces, pressed them, and did the thing – I checked my seam allowance and sewed my first bit of the SA silk lining. The silk handled very well in the machine. I usually HATE sewing with silky, slippery fabrics, but this was fairly easy to stabilize and manipulate. I put the sleeves together. After that, I was a little more confident with the fabric, and moved on to the front panels. On the front panel, I made my first major mistake: I miscut the welt pockets to where they looked like double welt pockets. Oops. Luckily, it wasn’t a big deal. I made sure the other side matched and moved on. I cut my back panels and sewed those together. I connected those to the front panels I’d made and tried it on to make sure I hadn’t made any grave errors. Last was to sew the sleeves to the body and sew the lining to the inside of the coat. This, like so many things in this project, proved far more difficult than I’d anticipated, but I used one of my tailoring books as reference and did the thing. It took me a while to complete this step, as I didn’t want to screw anything up and some of the cut-down seam allowances in the coat were VERY short. 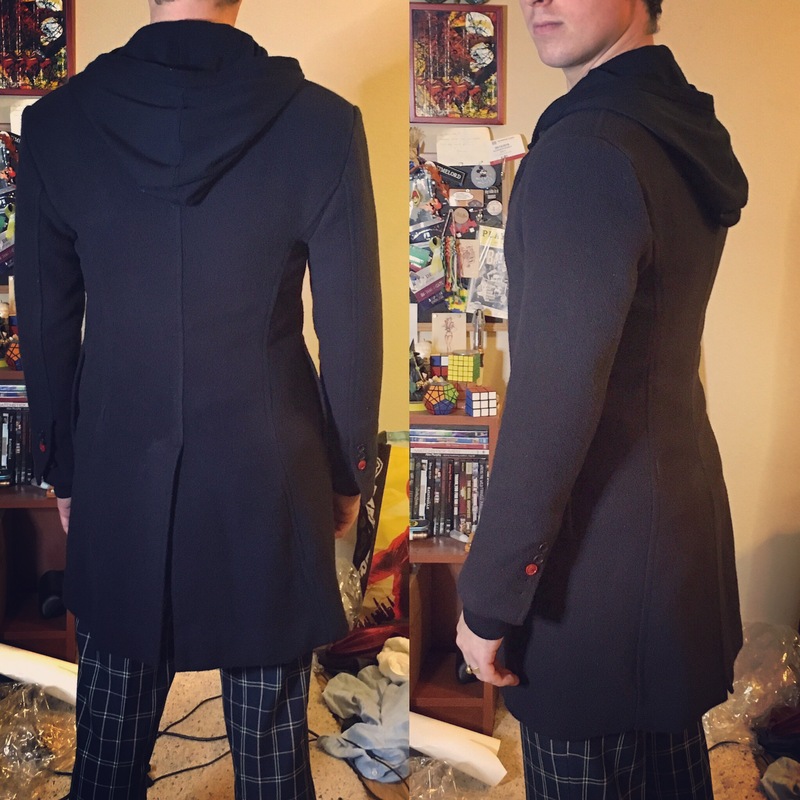 A local Whovian event was happening down the street from me, so I quickly basted down some of the details and went in my (almost) new coat! 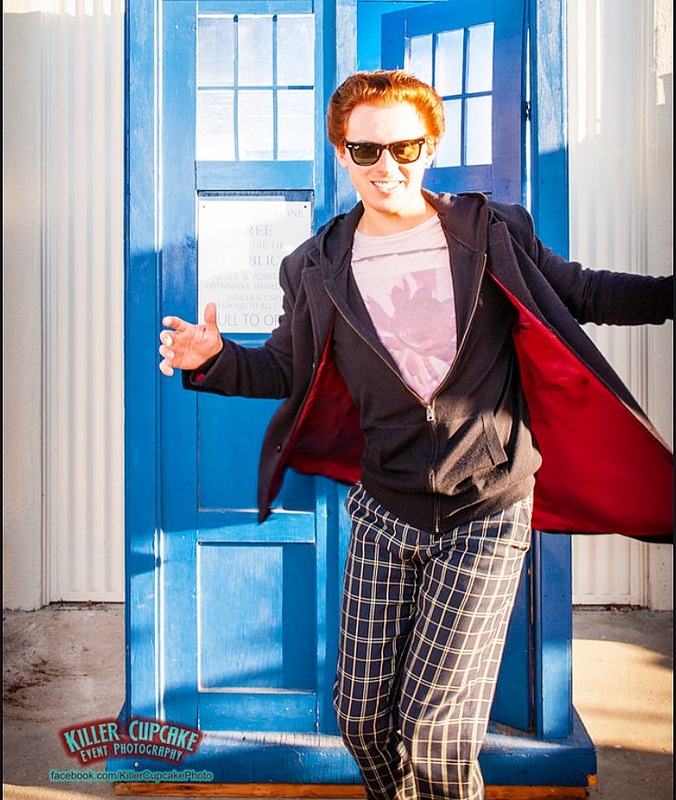 It was a small event, mostly filled with people I knew, and it was very cool to show off the coat. But a few problems started to emerge as I wore it out for the first time. When I got back home, I finished the detailing (including loads of handstitching) and hung it up. But I quickly revisited the project, because I can’t leave well-enough alone. The shoulder pads were simply too big. It made the coat awkward to put on or take off, and gave me beefier shoulders than the coat should give. I bought some smaller, padstitched muslin shoulder pads. EDIT: It should be noted that the original coats actually had no shoulder pad reinforcement at all – the weight of the camelhair was considered sufficiently bulky. 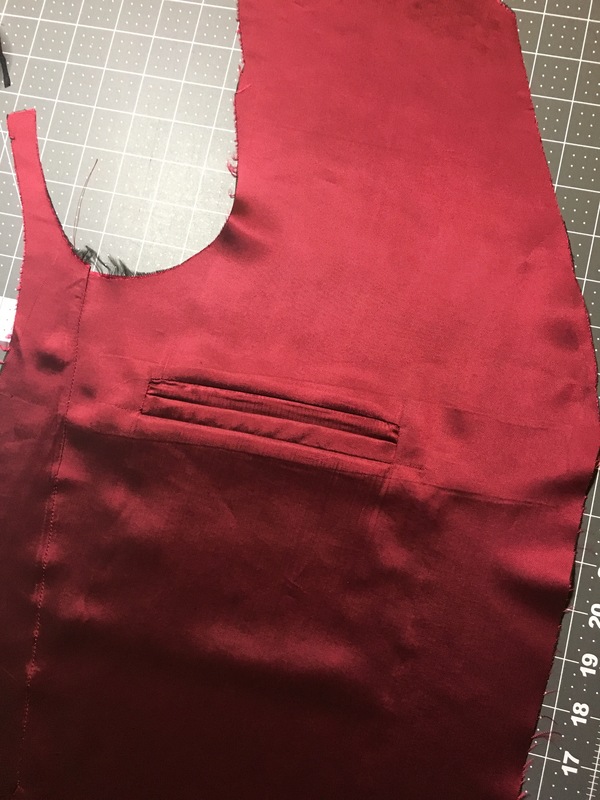 I realized I had miscut the lining pattern when I initially tried to sew in my lining – the right back panel had too much removed from the side seam and it didn’t physically reach across the whole hemline. I had it roughly patched with some scrap silk for the moment, but that would need recutting. 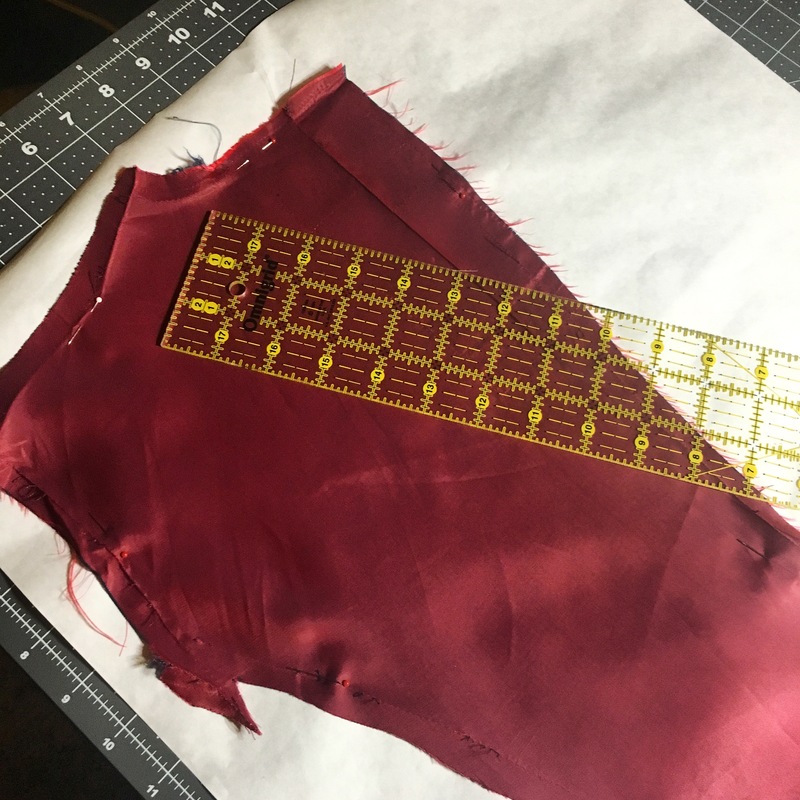 On the same notion, I had significantly misjudged how I repatterned my back panels, and the coat barely buttoned closed. Thankfully for me, it had taken me less than 2 yards of fabric to do the whole project! So I still had nearly ¾ of a yard of silk left, plenty to recut the back panels. I pulled the back panels out entirely and measured how much space the back panels needed to cover – I had been off by nearly an inch. On both sides. I carefully repatterned my lining, cut, and reattached the whole thing after replacing the shoulder pads. And finally I was able to breathe a sigh of relief. The coat was to my satisfaction. 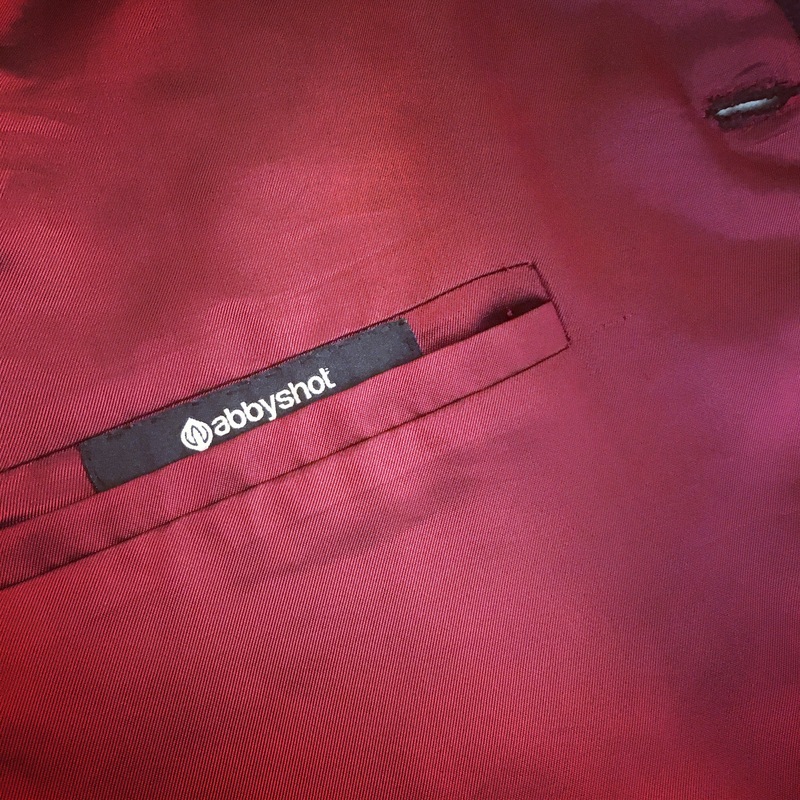 The last thing to do was to stitch the Abbyshot label back into the coat – as they deserve much praise for the coat they’ve designed. On that note, allow me to briefly discuss the Abbyshot coat in its flaws and triumphs. Overall, the coat off-the-rack is excellent. There was only one minor pattern issue I had to fix, aside from the fit (I recommend buying a size that fits you). The outer fabric is spot on for color and texture – the only quibble is that it has a twill in the wool not present on the original camelhair (talk about splitting hairs). It’s also a bit lighter than the original fabric (which is a 20oz camelhair). Otherwise, a perfect choice of outer fabric. The lining fabric (left in photograph at left), which I replaced, it as good as you can ask for the price. The lining is polyester and a red shot with blue, instead of the screen accurate black. It gives the shine a little less depth of color than the real stuff, but you really have to see it in person to tell. It photographs wonderfully, and it’s a sturdy, hearty fabric. 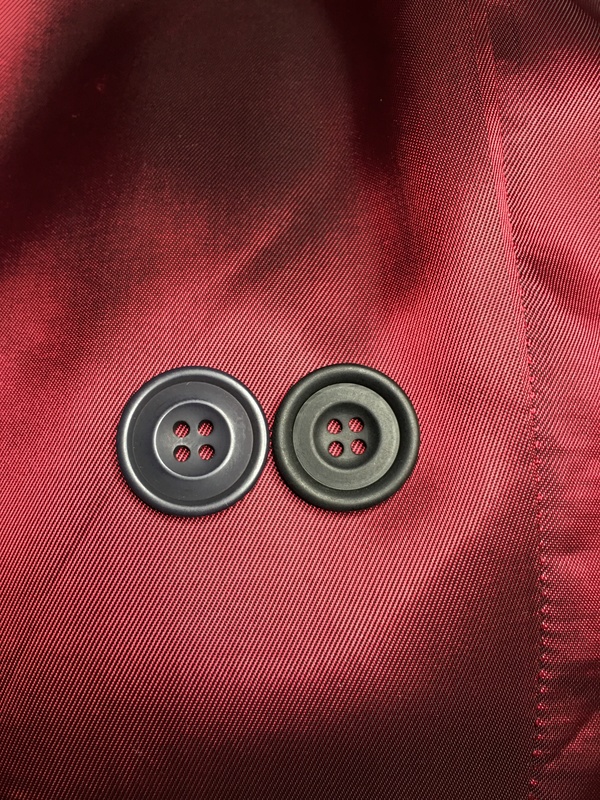 Where the coat falters most is the easiest replacement – the buttons. The buttons Abbyshot provides (left in photograph at right) are okay at a distance but any closer and their flaws are notable, including the fact that they’re… navy blue? The real buttons are black horn and readily available in the UK. 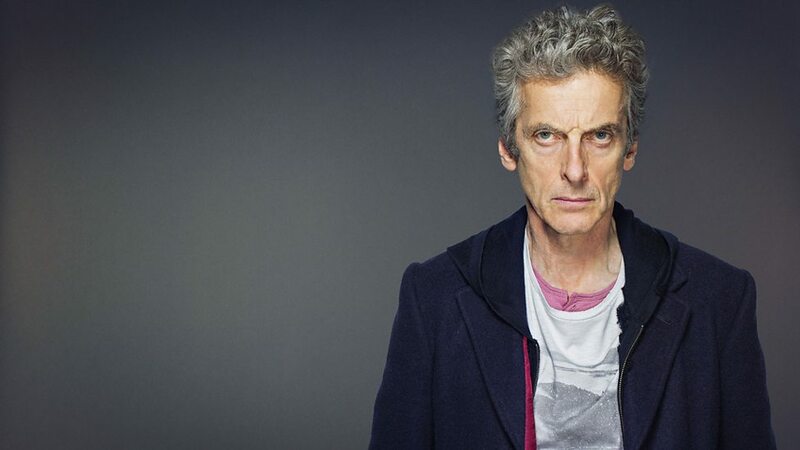 A simple replacement, one that I did minutes before my photocall with Michelle Gomez. Extremely similar plastic versions of the SA buttons are available in America. To Abbyshot’s credit, these are really the only complaints I have with the garment at all. They collar is good for the S9 coat (though not the S8 coat), the sleeves are properly vented, the coat length is great, and it reads beautifully. I give it an A. You won’t be able to beat it for the price anywhere. Not by a longshot.